"Tired of being a shiny face Cinderella by the time the clock hits 12? Turn down the shine and control excessive sebum with our Free From Oil & Troubles #3! This box is the ultimate go-to box for covering those pesky little pimples, treating blemishes, keeping skin matte all day and soothing troubled yet sensitive skin. Our oil absorbing products are proven to work-fast, so that your skin is left refreshed, smooth, blemish free, and healthy-looking!" Full Size Product is 90ml; $35 - received 2 (both morning & night) in this box. As amazing as these cleansers sounded, I've been overloaded with cleasners from Memebox, so these were part of a deluxe sale. Full size product is 30ml; $22 - full size product received. I was excited to try out a pore tightener, and one that suppressed melanin was just a bonus. I found this ample to tighten my pores ok, but not being special enough to repurchase this specific product. 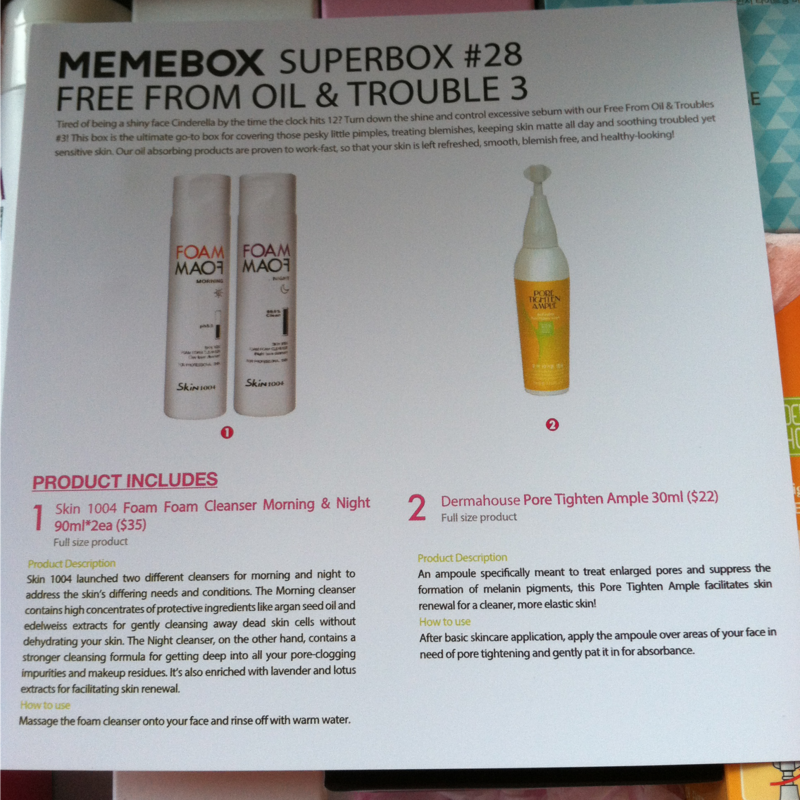 Memebox features pore tightening products in a lot of boxes, so I'll keep trying new ones for now. Full size product is 140ml; $35 - full size product received. This water sounded amazing, but by looking at the bottle, there is clearly oil mixed in it. Not something I need more of. This product was passed along. Full size product is 30ml; $26 - full size product received. I love this mask! The texture is really neat, it feels nice on the skin, it doesn't dry out my skin, and it noticeably tightens my pores after use. Full size product is 40ml; $24 - full size product received. I'm unsure about this product, but I still use it. The top layer contains BHA and AHA, and the bottom layer contains calamine and volcanic ash. I expected it to dry out blemishes overnight more than it does, but I still use it in the hopes that it's actually doing something - anything - to help heal blemishes faster. Full size product is 10g; $34 - full size product received. Few things upset me more about beauty products than loose powder flying everywhere. This product was passed along. This was a good box. I felt like it screwed off-track a bit with the oil/water spray, but overall, I'm glad I bought it. In case you have seen other reviews and are confused, this box was an oversell, and I was one of the customers who received the second box with replacement products they ran out of from the original box. Disclaimer: The Glitter Chic blog purchased the product(s) mentioned in this post for the purpose of review and evaluation. No monetary compensation was received for this post. This blog contains affiliate links.